Author(s) Thomas, George, B.; Weir, Maurice, D.; Haas, Joel, R.
This text is designed for a three-semester or four-quarter calculus course (math, engineering, and science majors). 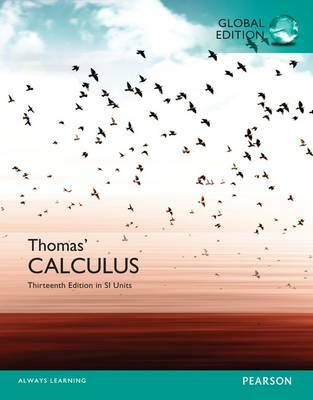 Thomas’ Calculus, 13th Edition, introduces students to the intrinsic beauty of calculus and the power of its applications. For more than half a century, this text has been revered for its clear and precise explanations, thoughtfully chosen examples, superior figures, and time-tested exercise sets. With this new edition, the exercises were refined, updated, and expanded—always with the goal of developing technical competence while furthering students’ appreciation of the subject. Co-authors Hass and Weir have made it their passion to improve the text in keeping with the shifts in both the preparation and ambitions of today's students.